Victoria, Mahe (Seychelles) – Octobre 8, 2017 (travelindex.com) – Alain Saint Ange said “Analysing who are the people who stand behind politicians, investors, corporations and the economy; It is the working people. Many are employed and some venture out by becoming what is today simply called the self-employed workers. It is a fact that the Government of the day can propose a new regulation that can better the lives of all its citizens, inclusive of every worker, the self-employed and the business community, as and when they feel the need to do so arises. The Opposition in the Seychelles National Assembly can, on their part, propose a Private Members Bill if and when they feel there is the need to bring about better conditions for the citizens, inclusive of every worker, the self-employed and the business community, of the country. They have successfully shown that for the Offshore Sector, their Private Members Bill was duly assented to by the Head of State. The “Seychelles Labor Union” (SLU) is born following a meeting of a group of workers at the Savoy Hotel on Wednesday the 4th October 2017. It was at 1700hours when a group of workers and also members of the self-employed community gathered at the Savoy Hotel to be counted as founding members for a new Trade Union in Seychelles. They came from all professions and from diverse employment groups. From teachers to health workers, from stevedore workers to landscape gardeners, to musicians and entertainers, office workers, taxi drivers, truck drivers and shop owners were all present. It was Alain St.Ange, Paul Chow, Bernard Port-Louis and Peter Sinon who opened the meeting with short addresses to explain broad objectives and the reasons for the creation of a politically independent Union. Recognise, Respect and Remunerate workers equals a Responsible workforce was the theme discussed and adopted as the motto of the SLU. On the question of the operating location of the Union. Members were assured that it will be in Victoria and soon the specific office space will be confirmed. Alain St.Ange emphasised that the SLU makes a new departure as the very first Independent Trade Union and is not affiliated with party politics as he congratulated the movement’s founding members present coming from across the political divide for being present. Today the Government of the day can propose a new regulation that can better the lives of Seychellois who are employed and also for those who venture out by being what is today called the self-employed. The Opposition in the Seychelles National Assembly can also, on their part, propose a Private Members Bill if and when they feel there is the need to bring about better conditions for the citizens of the country. This they have successfully shown can be done when they took up the issue for the Offshore Sector and their Private Members Bill was duly assented to by the Head of State. As the winds of the Southeast monsoon start to ease around the Seychelles, manta ray sightings are being reported at many of the surrounding islands. On Denis Island, divers and the resident fishing crew have been spotting a few rays feeding in the shallows since late August. The team on D’Arros has also witnessed multiple spectacular congregations recently. Globally, there are two species of manta ray; the Giant manta (Manta birostris), and a smaller species, the Reef manta (Manta alfredi). The Reef manta is most common in the Indian Ocean, including around the Seychelles. Reef mantas are Red Listed under the IUCN as “Vulnerable. This is mainly due to the species being exploited by Asian markets for their gill rakers for their use in traditional Chinese medicine. Fortunately, in Seychelles, there is no manta trade to Asia, thus the fishery is practically non-existent. Manta rays, like most elasmobranchs, have an extremely slow reproductive rate, making them quite vulnerable to over-exploitation. They start maturing at around 15-20 years of age and producing one pup every one to three (or even more) years. The Manta Trust is a UK-based charity that was formed in 2011 to investigate global movement patterns, feeding ecology and the demography of manta rays. The work that they do will help scientists gain a better understanding of the health and size of the manta population, as well their movement patterns through the Seychelles archipelago. The Trust also constantly seeks the help from the general public to assist with their efforts through photo submissions. Individual mantas can be identified through the unique pigmentation patterns on the ventral side of their bodies and it is relatively easy to collect ID photos of them by free-diving down facing their front side as they approach and snap a photo as they swim overhead. The Trust is also very engaging with the public. The team will happily provide you with information on your personal encounter with a manta. They reply to each submission with details of the history of the manta ray that was photographed which includes information such as: the name of the manta, its ID number, its gender, its size, and where and when it has been sighted before. If you happen to spot a manta ray that has not been previously recorded, you can also have the privilege of choosing its name. So the next time you are diving in Seychelles, or anywhere else in the world, be sure to keep an eye out for these gentle giants and have your camera ready. You can contribute directly to the research and conservation of manta rays by submitting your images and sighting encounters through the Manta Trusts online submission form. Alternatively, you can email your images to IDtheManta@mantatrust.org. World Tourism Day is celebrated in Seychelles with a grand Seychelles Ball where the tourism industry comes out in numbers to join the public sector in the event of the year. For an island so dependent on their tourism industry, the annual Seychelles Ball is a night that continues to attract everyone who believes in tourism and those who are not shy to say they are part of that industry that has become the pillar of their island’s economy. The Tourism Ball provides that unique opportunity for stakeholders in the industry to network and socialize in a more relaxed atmosphere. Minister Maurice Loustau-Lalanne, the Seychelles Minister for Tourism, Civil Aviation, Ports and Marine and Sherin Francis, the CEO of the Seychelles Tourism Board addressed the packed Ball Room at the Eden Bleu Hotel and used the evening to say thank you to the private sector trade for their support and togetherness. It was at this 2017 Seychelles Ball that Alain St.Ange, the former Minister for Tourism and Culture & Minister of Tourism, Civil Aviation, Ports and Marine received a certificate of recognition for the contribution he has made while leading this primary sector of the economy and also for his continued contribution towards the betterment of this industry. 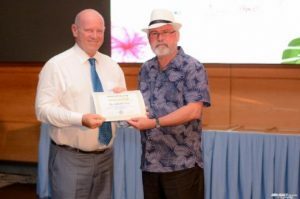 The Certificate of Recognition says:- “The Seychelles Tourism Board proudly recognises Mr Alain St.Ange for his valuable contribution to Seychelles’ Tourism Industry as Seychelles Tourism Board Director of Marketing and Chief Executive Officer and as Seychelles Minister of Tourism”. It was Minister Maurice Loustau-Lalanne, the new Minister for Tourism, Civil Aviation, Ports and Marine of Seychelles who presented former Minister Alain St.Ange with his Certificate of Recognition. This year was also the opportunity to add more names on the Tourism Pioneer Wall at the island’s Tourism Academy. Four names from the new era Sir James Mancham, founding President of the islands and the man credited to have launched tourism as an industry for Seychelles, Louis D’Offay the longtime Chairman of the Seychelles Hospitality & Tourism Association and Owner of the L’Archipel Hotel of Praslin, Maryse Eichler of Seychelles Hotels and the first head of the island’s Tourism School, Zita Monthy of Carefree GuestHouse joined Adrien Michel, John de Matta Mascarenhas, Richard Mancham and Raymonde Delorie on the island’s Tourism Pioneer Wall. Family members of Sir James Mancham, Mr Louis DOffay, Mrs Maryse Eichler and Mrs Zita Monthy were presented with a certificate recognising them as tourism pioneers and all of the eight names will now be featured at the Tourism Pioneers Park. The park located next to the Seychelles Tourism Academy at La Misere has been designated to honour and recognise individuals who have served the tourism industry with passion and have played a pivotal role in strengthening this industry which is today the pillar of our economy. The park was opened on September 26, 2015, by the former president James Michel and the first eight pioneers were unveiled on September 27, 2016. The honouring of individuals who have made significant contributions to the industry will now feature as an annual activity as part of Tourism Week. Alain St.Ange, the former Seychelles Minister is today the Deputy Secretary General of FORSEAA (Forum of Small Medium Economic AFRICA ASEAN) based in Jakarta Indonesia, listed as a Consultant for TMN (Travel Marketing Network) in New York USA, Co-Chair of the SUNx (Strong Universal Network) Organisation in London UK, Vice President & Founding Member of ICTP (International Coalition of Tourism Partners), Consultant to PMAESA (Port Management Association of Eastern and Southern Africa) based in Mombassa Kenya, CIOA ( Cruise Indian Ocean Association) based in Durban South Africa and for Cruise Africa. Travelindex is one body that has been republishing the weekly Saint Ange Tourism Report and from the Seychelles Alain St.Ange says that he is happy to see that the World Tourism Organization (UNWTO) has officially approved Travelindex affiliate membership application, adding to a group whose members include such prestigious institutions as CNN, World Tourism Forum Lucerne, Club Med, European Travel Commission, International Air Transport Association (IATA), Hong Kong Tourism Board, Amadeus, George Washington University, Colorado State University, The Hong Kong Polytechnic University – School of Hotel and Tourism Management (HTM). The Travelindex application for UNWTO Affiliate Membership has been approved by the Executive Council at its 106th session, and has been ratified at the 22nd Session of the UNWTO General Assembly held in September 2017 in Chengdu, China. The UNWTO Affiliate Members Programme recognizes the great potential in collaborating with organizations in generating global sustainable wealth through enhanced tourism knowledge, ethical and responsible principles and joint initiatives. “We’re truly honored to have been approved as a UNWTO Affiliate Member and to become part of an incredible array of passionate organizations, destinations, NGOs and educational institutions all committed to the UNWTO Mission of promoting responsible, sustainable and universally accessible tourism.” said Mr Bernard Metzger, Founder of Travelindex. UNWTO generates market knowledge, promotes competitive and sustainable tourism policies and instruments, fosters tourism education and training, and works to make tourism an effective tool for development through technical assistance projects in over 100 countries around the world. UNWTOs membership includes 156 countries, 6 Associate Members and over 500 Affiliate Members representing the private sector, educational institutions, tourism associations and local tourism authorities. Congratulations to Ramu Pillay, the Chairman of the Indian Association of Seychelles and his Committee Members for another great edition of the Seychelles-Indian Day Celebrations. Everyone who believes in the diversity that makes Seychelles what it is today were present over the three days of rich colourful experience. Vice President Vincent Meriton was present at the Official Opening Ceremony and this echoed a positive message that Seychelles embraces its diversity. Tourism, Culture & Environment Ministers were also present and the Tourism Minister pledged continuous support for the annual event. The fifth edition of the annual Seychelles-India Day Celebrations kicked off on Friday October 6 and it transported the Seychelles capital of Victoria across the Indian Ocean and into the heart of India. The three-day event was filled with singing, dancing, flavoursome Indian cuisine and vibrant colours. The event is a collaborative effort between the Indian High Commission, Ministry of Youth, Sports and Culture, the Tourism Ministry, Seychelles Tourism Board, the Seychelles India Day Committee, the Indian Association, among others. Representatives of these stakeholders met with the media on Thursday to highlight the main activities that would be featured this year. This was during a press conference at the headquarters of the Ministry of Tourism Civil Aviation, Ports and Marine, at Botanical House, Mont Fleuri. The Minister for Youth, Sports and Culture, Mitcy Larue said on top of cultural events, the organisers have also added more sports activities, including a mini-marathon and badminton tournament. There was also a special chess event, with the participation of Indian chess Grandmaster Viswanathan Anand. Mr Anand who dominated the world of chess for six years from 2007 to 2013, took part in a speedy chess competition against 18 Seychellois chess players at the ex-national assembly hall, at the National Library on Saturday. Another innovative event this year is the inauguration of what has been dubbed the India Diversity Garden located at the Botanical garden. The Seychelles Creole nation of around 93,000 people today, is primarily made up of the descendants of five groups: French, British, African, Chinese and Indian settlers. It was with the aim of celebrating the island nations Indian heritage that the first Seychelles India Day was initiated in 2013, as a collaboration between the Indian Association of Seychelles and the Ministry of Tourism and Culture. Five years on, Ambassador Maurice Loustau-Lalanne pledged the tourism ministry’s continuous support for the annual event, adding that the Seychelles-India Day Celebrations has also contributed to raising awareness about the island nation as a tourist destination. “We will continue to support the Seychelles-India Day Celebrations and if it requires that we put additional flights eventually because of its success, to Bombay through Air Seychelles, we shall do it,” he added. The Fun and Food fair set by and held in the car park of the Stad Popiler remains a key activity. The fair which opened on Friday morning, will remained open until Saturday. The official inauguration of the event itself was held at the International Conference Centre on Friday evening. Indian celebrity singers, dancers, choreographers performed again at this year’s Seychelles-India Day Celebrations. It all started in 2013 when a group of patriotic Seychelles with respect for the islands diversity conceived the idea that the islands needed to celebrate the five branches that makes the Creole People of Seychellois who they are today. Alain St.Ange chaired the meeting as the then Minister responsible for Tourism and Culture alongside Benjamine Rose, the PS for Culture and Elsia Grandcourt, the CEO of the Tourism Board, and it was agreed that a Seychelles – Indian Day Celebrations would recognise the part played by the Seychellois of Indian Origin to make Seychelles the successful country it has become. The Indian Association of Seychelles and the Indian High Commission were also on board and the project was seen as one for the Country and the celebrations would then become listed as one of the Seychelles National Events alongside FetAfrik, Seychelles – China Day Celebrations, the Commonwealth Day and La Francophonie and prepare the celebrations of what the islands are today with the celebrations that unite everyone together and that is the Seychelles Festival Kreol. The 2013 Seychelles – India Day Celebrations was recorded by the International Press as “Seychelles islands welcome glitzy and glamorous Bollywood stars”. The press wrote:- “After taking Europe by storm in their mission to mark the 100 years of Bollywood, cinema high profiles of the Indian film and music industry touched down on Seychelles islands for the first edition of the Seychelles-India Day Celebrations. Once Emirates Airlines landed at Seychelles International Airport, the 23 Bollywood mainstream actors, actresses, singers, flautist, and percussionist disembarked in true show-business star fashion. Never before has Seychelles International Airport hosted such a large group of the finest from the Indian entertainment world. The star of the moment was Ranganathan Madhavan, the guest of honor of the Seychelles-India Day Celebrations. Madhavan, ranked among the top ten Indian actors, will join Terrence Lewis, the ace Indian choreographer, and other Bollywood stars in an open air gala evening – flooding the town of Victoria with Indian tunes. He said that he is thrilled to be in Seychelles. Aakriti Kakkar, another knock-out Bollywood vocalist, walked her way down the plane – the ultimate depiction of the modern Indian super star. “I am proud to represent my country for the Seychelles-India Day Celebrations. Seychelles is an island of un-touched beauty, and I am looking forward to discover the Island,” said Aakriti Kakkar. Sivamani, Indian top percussionist, brings to Seychelles his own fusion of drumming, of which he gave an impromptu session to the media interviewing the celebrities at the VIP Lounge at the Seychelles International Airport. For the red carpet event at the first edition of the Seychelles-India Day Celebrations, celebrities Aakriti Kakkar, Shazahn Padamsee, Anjana Sukhani, Miss India Universe Ushoni Sen, actor Madhavan, and Chef Sanjeev Kapoor will be dressed by New Delhi-based designer collections by Mayyur Girota. Mayyur Girota is the official designer of the Seychelles-India Day Celebrations. It was at this first Seychelles – India Day Celebrations that the Top Indian percussionist Sivamani enthralled the Seychellois public. This was in October 2013 and India’s top percussionist, Sivamani, was flown in to lift the heartbeat of Seychelles through an enthralling performance. He represented India as part of a celebrity-studded, 50+ Indian team, in Seychelles to celebrate the first ever Seychelles-India Day. “Seychelles-India Day is a 3-day extravaganza to showcase Indian talent and culture. Sivamanis performance was a high-energy bugle call to this most important event in the relationship between Indians and Seychellois,” said Indian High Commissioner Thanglura Darlong. Siva, as he is fondly called by his fans and peers, is a rare phenomenon in the world of music. Known to create magic with just about any instrument or flat surface, his audience has crossed the boundaries of usual classical music, getting just about anyone foot-tapping to his beats. Schooled in both Carnatic rhythmic tradition and western jazz instruments, Siva is truly a world-class percussionist. Siva has played the world over with some of the best international artists and is also a part of world music outfits like the Zakir Hussain World Drum Ensemble, and a most important member of the great maestro AR Rehmans troupe. The Seychelles India Day Celebration Committee and the Ministry of Tourism and Culture, in close collaboration with the Indian High Commission and local business houses, promised an annual celebration to mark one of the five historical branches that makes the Seychellois the people they are today. “I have been able to serve Seychelles as Minister for Tourism and Culture and later as Minister for Tourism, Civil Aviation, Ports and Marine and with the Team at Culture and Tourism put into place events that should continue to bring more unity in the Islands. Alain St.Ange is quoted for these famous lyrics by John Lennon at the opening of an edition of the Carnaval International de Victoria “You may say I’m a dreamer, but I’m not the only one. I hope someday you’ll join us, And the world will live as one” I was sure that dreaming of UNITY will promote respect and bring about a climate where democracy will be the guiding principle. Club Liberté has recently welcomed aboard a new General Manager – Mr. Michel Claeys. It was interesting to see the new General Manager who has a name in the casino business. Michel has voyaged all around the globe driving the entertainment business to accomplishment in numerous countries. Club Liberté team was eager to get on board such a capable professional, who joined the group toward the end of September. Michel Claeys explains “My professional career in the casino business started 40 years ago and like most of us started as a dealer or croupier in Belgium – then moved away to obtain my British Gaming License in Cardiff and Manchester , other countries followed suit very quickly such as Holland, France , Romania, Turkey , Egypt, Lebanon , Morocco , Canada, North Cyprus. I have a world wide excellent reputation in the the mysterious world of gaming and I am constantly in demand for my advice, expertise and knowledge. I feel very positive that I can highly contribute to the Club Liberté Casino of Seychelles and to the tourism industry in general if the islands. In spite of being a leader in such a sphere of business as night entertainment, Michel is a family man, who welcomed his newly born daughter 1 year ago. “It will be one year since the night Club Liberté opened its doors on 28th of October last year and we want to accomplish something unique for this occasion”says Michel. Club Liberté team has experienced numerous thoughts on special occasion and affirmations to their loyal visitors and chose the idea of being valuable to all the public of the Seychelles. Club Liberté is proposing to blend in with an association in Seychelles and coordinate by all methods in showcasing introduction, fascination of sources and gift of materials or fund raising against drug enslavement. “We have met with the pioneers of this association and acknowledged how grave the issue is and how much power is required keeping in mind the end goal to unravel this” says Irina Etienne, marketing manager of Club Liberté. Irina Etienne went on to say that it was with this goal that will be the best step forward of Club Liberté`s public life as it enters its second year of operation. Club Liberté is in the new chapter of its improvement and numerous new surprises are set up to its customers for the coming Festival Creole, Christmas & New Year’s Eve and many other worldwide and local events. This latest appointment highlights their continued expansion and ongoing commitment to develop the services they offer to growing client base, as well as career opportunities for team members. Managing Director of Club Liberté Jake Waller on his part said:- “The quality of our services is defined by our people, and Club Liberté is committed to attracting candidates of the highest caliber to lead the business. Michels appointment exemplifies this commitment; he brings a huge amount of valuable experience and expertise to the company and is the perfect person to lead this business into its next exciting chapter of growth”.